bout 2-3 hours from Zurich by car or a combination of train and bus, Savognin is a historic Romansh-speaking village, in the Surses valley on the route to the Julier Pass, south of Chur and Lenzerheide and north of the Engadin. It's a good family-friendly base for visiting other ski areas and attractions in the area (with winter tyres and sometimes snow chains). 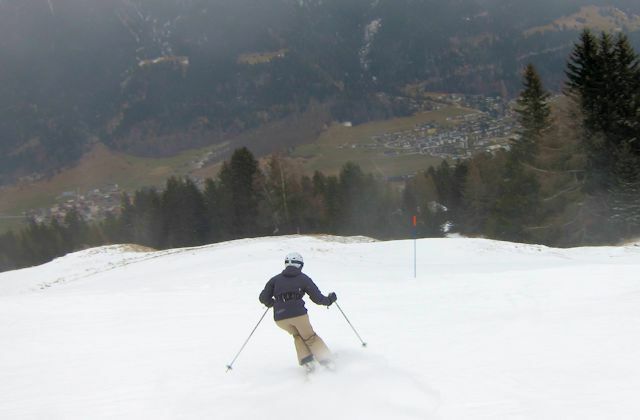 It has some very good pistes itself, particularly for learners and intermediates, but also with a few challenging runs and off-piste areas. 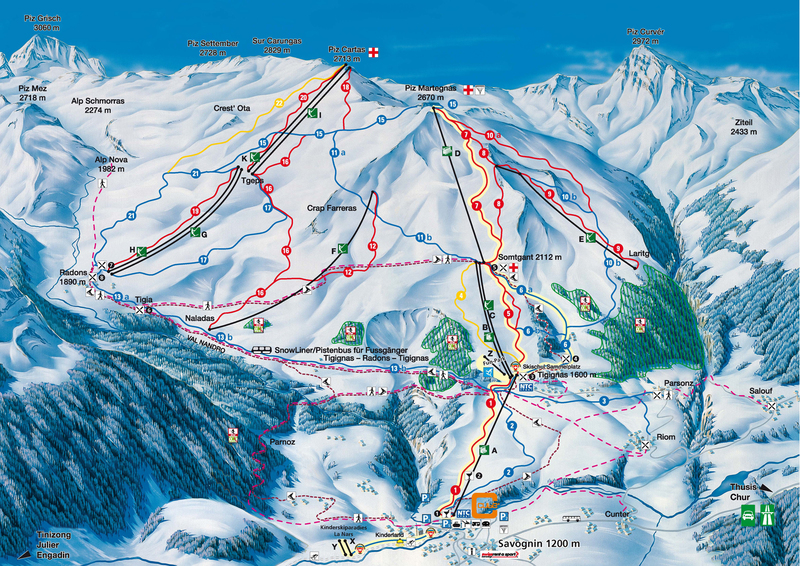 Unfortunately there are only surface lifts to reach all but the main runs from Piz Martegnas down to the base station, situated at the foot of the valley below the village. There is an 11k run from Piz Martegnas all the way down to the valley station. The Tigia restaurant at Radons does a number of regional specialities. Roggi's Baizli is the lively heart of mountain eating and drinking. For apres, the locals often head to James Beach Bar on their way down. 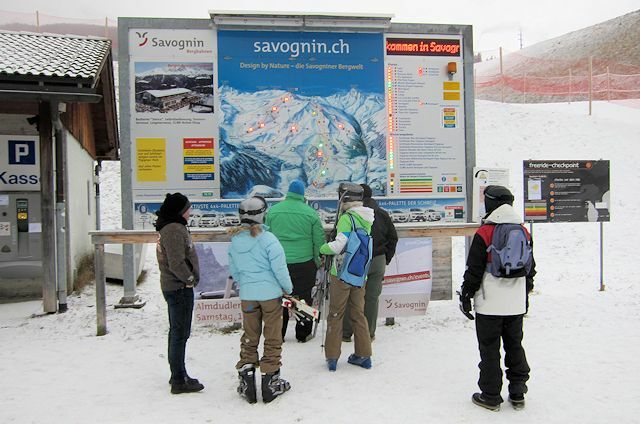 The best destination to access the downhill slopes by public transport in this ski area is Savognin Cresta. It is a 10 minute walk down to the base station from the bus stop, but a courtesy bus also runs between the base station and the through bus stop. From Zurich the least travel time is 2 hrs 37 mins with as few as 1 changes going via Chur. From Basel the least travel time is 3 hrs 42 mins with as few as 1 changes going via Chur. The road distance from Zurich is around 164 km and the journey time is roughly 1 hr 50 mins. The road distance from Basel is around 249 km and the journey time is roughly 2 hrs 40 mins. 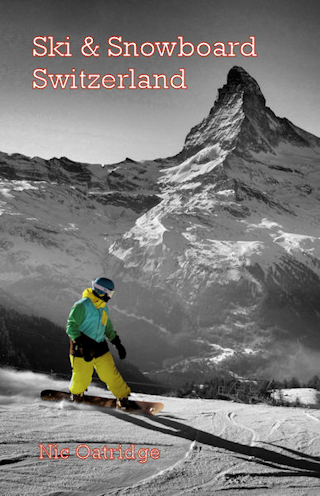 $$$ Cube Hotel, Savognin (3*) Right next to the lifts with pass inclusive to price, this is one in an innovative small chain of well-regarded hotels, ranked #1 in Savognin by TripAdvisor. $$ Ferienwohnungen Surses Alpin, Savognin Highly affordable apartments suitable for families and small parties in a convenient location.